Frosty and Friends Exotic Bird Rescue, Inc. - Rescue Stories Scarlet, Pretty Girl and Swoop These 3 beautiful babies are all over 25 years old. 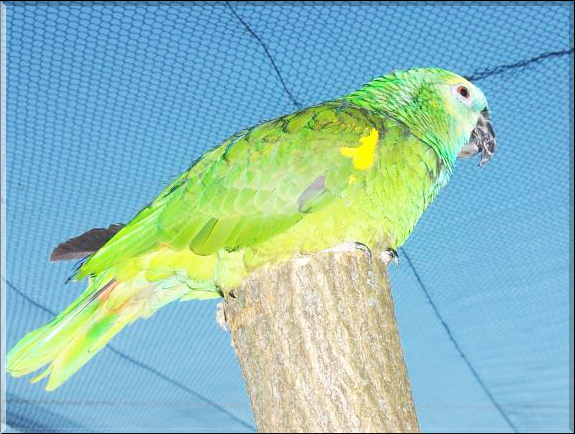 The 2 female eclectus and male blue-front amazon are all retired breeders. They had stopped producing and the breeder was not making money from them anymore. Scarlet and Pretty Girl were pluckers and Swoop has a tennis ball size tumor on his side. After being kept in a barn as breeders for their entire little lives, the owners were going to have them all euthanized as they were not 'sellable'. We were told they were wild, and couldn't be handled.....nothing could have been farther from the truth! As soon as they were brought here, we each picked up Scarlet and Pretty Girl and they laid their little heads on our chests.....we did the same with Swoop. They have brought such joy to our sanctuary and can be so silly and playful. Thank God the breeders found us! We love them soooo much! 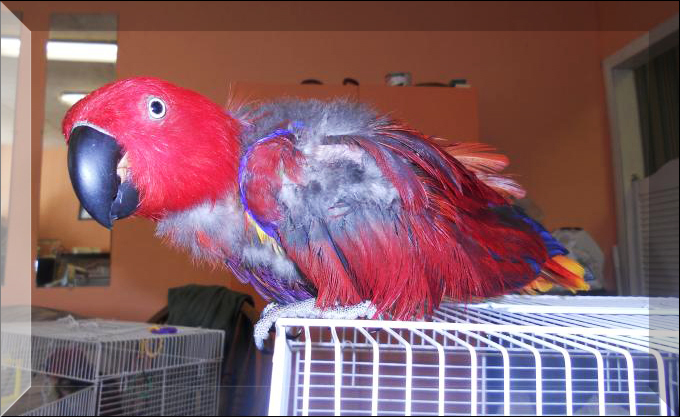 Update: Scarlet and Pretty Girl are both getting their feathers back in and our avian vet has removed Swoop's tumor! These 3 beautiful babies are all over 25 years old. 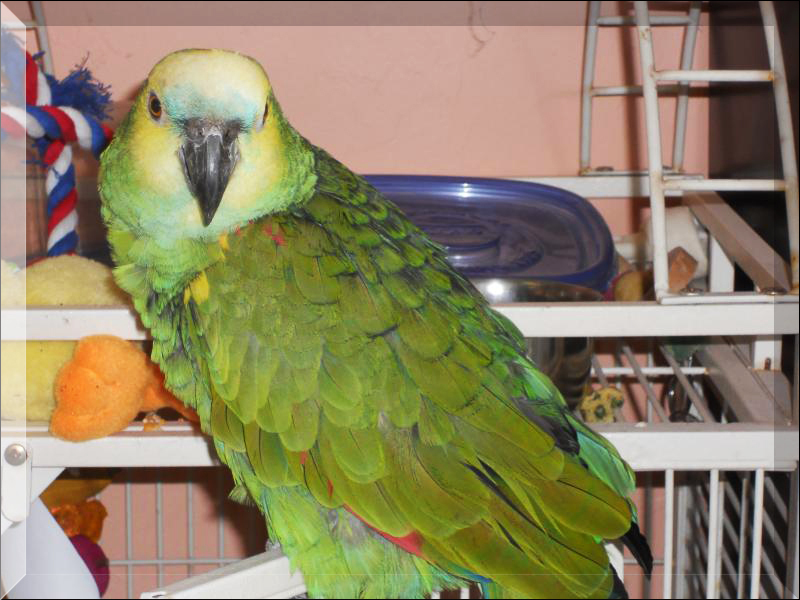 The 2 female eclectus and male blue-front amazon are all retired breeders. They had stopped producing and the breeder was not making money from them anymore. Scarlet and Pretty Girl were pluckers and Swoop has a tennis ball size tumor on his side. After being kept in a barn as breeders for their entire little lives, the owners were going to have them all euthanized as they were not 'sellable'. We were told they were wild, and couldn't be handled.....nothing could have been farther from the truth! As soon as they were brought here, we each picked up Scarlet and Pretty Girl and they laid their little heads on our chests.....we did the same with Swoop. They have brought such joy to our sanctuary and can be so silly and playful. Thank God the breeders found us! We love them soooo much! 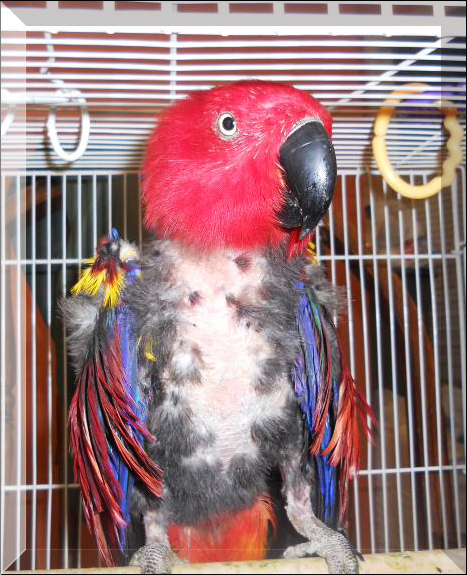 Update: Scarlet and Pretty Girl are both getting their feathers back in and our avian vet has removed Swoop's tumor! We will be adding a new "rescue" story each month. Please check back. Little "JOON" and "CRICKET" Joon came to live with us about two years ago. He had lost his mate and wasn't eating and was starting to pluck his feathers! He and his mate had stayed in a cage together for several years and we were told that he wasn't tame at all. 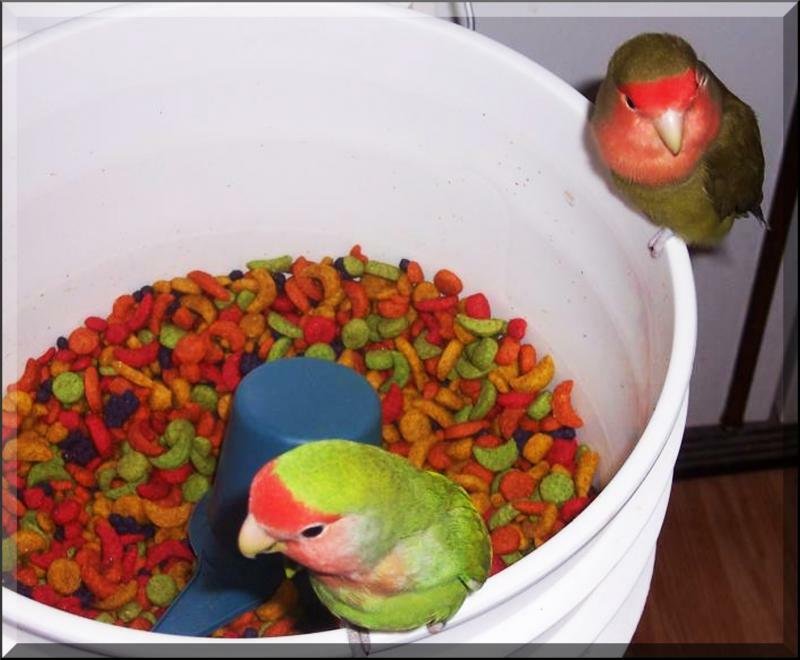 We already had little Cricket, our little one-footed peach-faced lovebird. When we took in Joon, we just sat his cage in the little bird room with all of our other small birds. Cricket noticed him instantly! It was love at first sight. She immediately flew over to his cage and climbed all over it trying to get close to him. He, of course, was a little frightened being in a new place. After a few days, we took the top off of his cage and Cricket flew straight in and sat next to him! Cricket was a sweet little hand fed lovebird that was very tame and loving. It was only a matter of days until we walked into the bird room and when Cricket flew over to sit on our shoulder, Joon followed! They are now inseparable! Joon will even give us kisses now. He started eating again right away and stopped plucking! He is so in love with Cricket and really enjoys being able to be out of the cage all the time. Although, they do fly into Cricket's little tent and snuggle up together at night. Ivory came to us after living his entire life, 21 yrs with a cigarette smoker. He doesn't have any feathers on his chest or under his wings. 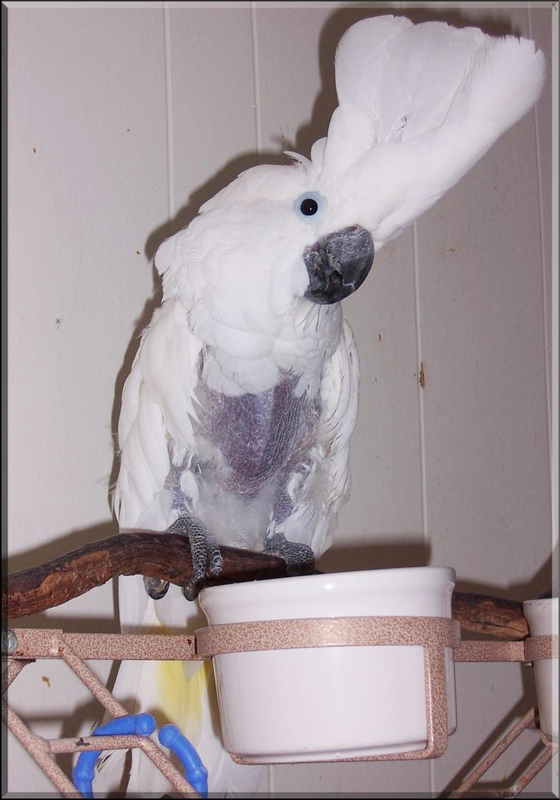 After having him checked by an avian vet from Chicago and our own Dr. Lewis, it was determined that the smoke had had irritated his feathers and skin to the point, that it destroyed the follicles. Those feathers will never return. We were also warned by Dr. Lewis that his life may be shortened due to breathing the smoke. Although his lungs sound clear, he said he has seen autopsies on birds who lived with smokers and actually died of a "black lung" type disease. (He was just trying to prepare us for what may happen in the future). 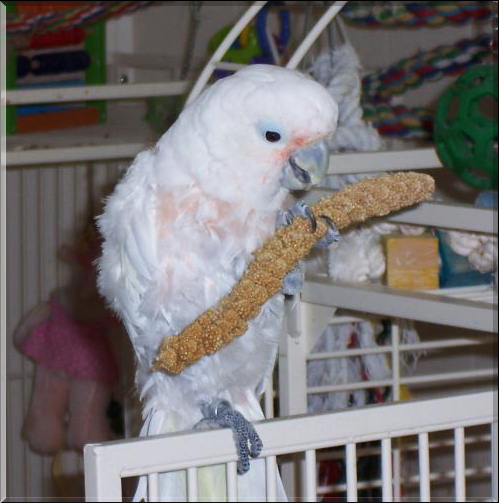 Ivory has been with us almost 2 years now and is such a sweet, loving, happy bird! He loves to cuddle and give kisses and does alot of dancing! His favorite phrase is "I love you, I sure do!" Unfortunately, his previous owner was dying from emphysema and had to find a home for him. He has become really good friends with our Frosty. went into a nursing home, Reno ended up with our family. When we first got him, he kept falling off his perch. We were afraid it was arthritis in his feet. We took him to see Dr. Lewis and found out there was no arthritis, which was amazing. Reno just needed some exercise. We began doing "step ups" with him several times a day. We would have him step up from one hand to another. His feet got stronger and he perches just fine now. We got him a bigger cage with a playtop made on the top, and put some different sized perches around to help exercise his feet and hung a rope bungee above his cage for him to climb on. The only thing Reno says is a very enthusiastic "helloooo" and "huh?" He loves to go outside in the summer. I'm guessing it reminds him of when he was in the wild. He is a very good eater and loves his scrambled eggs and fruit and vegetables every morning. He loves to give kisses too. We are so blessed to have such a wonderful bird in our "flock". He probably doesn't have too many years left, but the time he does have left will be filled with lots and lots of love and attention! Our sweet, darling little "Rutha"
Little Rutha came into our lives about four years ago. She had no feathers from the neck down and was absolutely petrified of anything and everything! She had spent the last couple of years in a ferret cage on the floor with 4 pitbulls in the house. She had no toys and nothing to do except to be scared and chew her own little feathers. It took about 3 months for her to trust us. We would go to her cage and talk to her several times a day. I started feeding her baby food from a spoon and warm oatmeal. We had to place quilts and blankets on the floor around her cage in case she were to fall off since she had no wing feathers. She eventually began to take treats from us and finally realized that we weren't going to hurt her. Then, one day while Mark was talking to her she literally jumped over on his arm! It was true love. She has actually turned out to be one of the sweetest, best behaved birds in our flock. She constantly says "hi Rutha" and "I love Rutha, Rutha!" She loves to sit with us at night and be cuddled. She still and may always chew some on her feathers, but we don't care if she's totally bald she is absolutely beautiful to us. Rutha will be 18 years old this spring. At least she never has to worry about ever going to another home. She has found her "forever" home with us!